I used it be a climate change denier back when Gore ran for president and a few years after. I’m no longer a denier. Yeah but climate change actually is bogus. With his signature, Washington became the first state in the nation to pass a law to protect net neutrality. Not huge news, but thought this was relevant to many of us. They should have joined years ago. I still laugh at the end of this thread's title. If only swearing was allowed and you added As*** Pie to it. It was always a little puzzling to me that they weren't in on it at the start. I think they finally woke up and are realizing that the idiocy going on is really going to impact them severely. Lucky for me, I'm not able to play online. I win. I remember seeing something about this regarding Twitch.tv as well. Didn't know how deep it went but if it's because of Amazon, then I can imagine a lot of stuff being inaccessible without AWS. In a monumental decision that will resonate through election season, the U.S. Senate on Wednesday voted 52-47 to reinstate the net neutrality protections the Federal Communications Commission decided to repeal last December. But it’s doa no matter what. f*** the Republican Party. Yeah unfortunately it has to get past the House, then if it makes it that far has to get past Trump. Best thing you can do? Look at this list, find your representatives in the senate. If they voted to restore net neutrality (for) (the good one), make sure to get out and vote for them this fall. If they voted the other way, go vote for whoever is their opponent. Pass this along to everyone you can find, and get everyone you know out to vote this fall. To put this in video game terms, you're paying your ISP and either MS or PS for online play. You don't want to have to pay yet again for a fast lane. No surprise both of the Iowa dips***s voted against. Unfortunately it's not an election year here. Last week, AT&T apologized for for its "serious misjudgment" in hiring US President Donald Trump’s personal attorney Michael Cohen to provide “insights” into how the new administration would handle issues like net neutrality and AT&T’s proposed merger with Time Warner Cable. Ultimately, the $600,000 AT&T paid Cohen for said insights became such a scandal, the company was forced to fire its top policy and lobbying man Bob Quinn, despite the fact that such behavior is arguably routine at the Dallas-based telecom giant. While AT&T would obviously like to move on from the scandal, watchdogs and several lawmakers would like to see the issue explored in more detail. New scheduling documents obtained through FOIA by corruption watchdog American Oversight show the Chairman met with with top AT&T executives at a private dinner in Barcelona a month after the company began paying Cohen. One of the AT&T executives at that meeting was top AT&T policy and lobbying exec Bob Quinn, who orchestrated the payments to Cohen and was fired by AT&T for what the company now acknowledges was "a mistake." “A private dinner between Chairman Pai and an AT&T executive who hired Michael Cohen to influence the president doesn’t reflect well on the impartiality of the FCC," said American Oversight Director Austin Evers in a statement. "Pai should disclose exactly what was discussed at the dinner and who organized the meeting. Did Michael Cohen set up a dinner where AT&T executives tried to sway a member of the president’s administration on policy that affects the company?" "We can’t know for sure until Pai tells the whole story," the group proclaimed. "The FCC has some serious explaining to do." 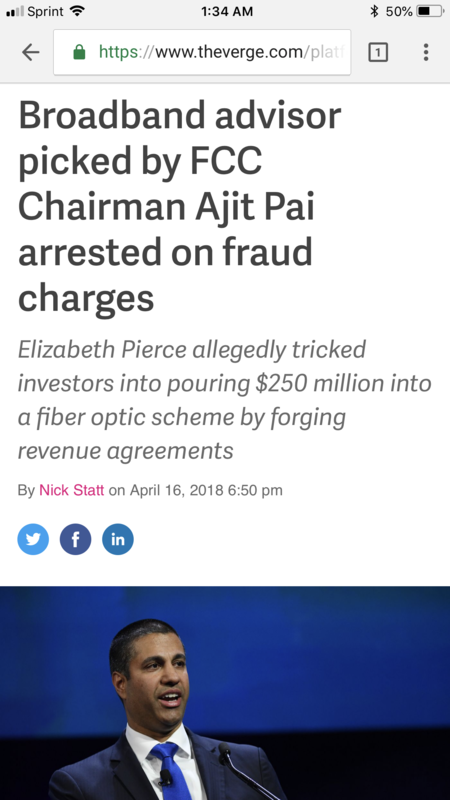 Given that Pai is arguably ultra-cozy with the industry he's supposed to be holding accountable, it's entirely possible that meeting would have happened anyway. But the group still believes that the company and Ajit Pai should be more transparent about the meeting, especially given the laundry list of favors (from gutting net neutrality to killing consumer privacy protections) that have rained down upon AT&T since Trump picked Pai to head the agency. 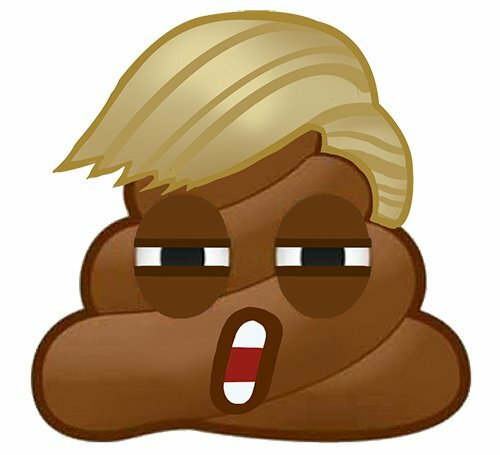 Where's the poop reaction, optionally and ideally with orange tint and blonde toupée? Wouldn't there be a chance for a provider to advertise as Net Neutral or something? Or does a provider own the lines to the homes/regions and you're stuck with that ISP? Pretty much the latter. At least here in the US, many of us have one and only one choice for high speed internet. I can either pay Spectrum, or tether from my phone. That's it. If Spectrum raises my bill $10 tomorrow, what can I do? Other people here at least have two choices (Verizon runs fiber to some areas but not all), but that's still two huge companies who still have massive market power. What's worse is that many of these ISPs are also television providers, and they are seeing that market shrink with everyone cutting the cord on their TVs. So, now they are really looking for new streams of revenue since they can't just charge everyone hundreds of dollars a month for terrible cable TV. Before that, when ADSL was the best option, a company started rolling out fibre, and they still own those cables, but most councils in the city are forcing them to remove them since they're so ugly. Now we have NBN fibre rollout on a national scale, and it's a slow mess... But at least you can choose which slow mess you're associated with. We, the taxpayers, paid for these company's infrastructures. They were allowed to build these wide spanning networks due to government subsidies. This is why all ISPs should be classified as common carriers.